Weapons research is conducted at particular times and places, under certain circumstances and conditions. I have expressed this by saying that weapons research takes place in some context. There have been instances of individuals conducting weapons research simply out of interest—Hiram Maxim the inventor of the first effective machine gun, fits the mould of someone who just liked inventing things—but in the vast majority of cases it is conducted in response to something external, something outside the research facility. 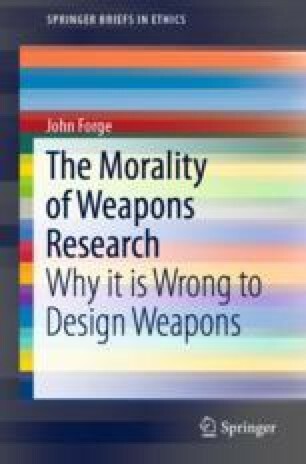 In order to show that weapons research done in one context often has effects in quite different contexts, I give a number of examples in this chapter. The first series of these is intended to provide reasons to accept the evolution view of technology, which implies that weapons research has indirect as well as direct effects, because one innovation can lead to others down the line. I begin with the idea of the context of weapons research and offer a characterisation that is informed by matters that we have discussed in earlier chapters.